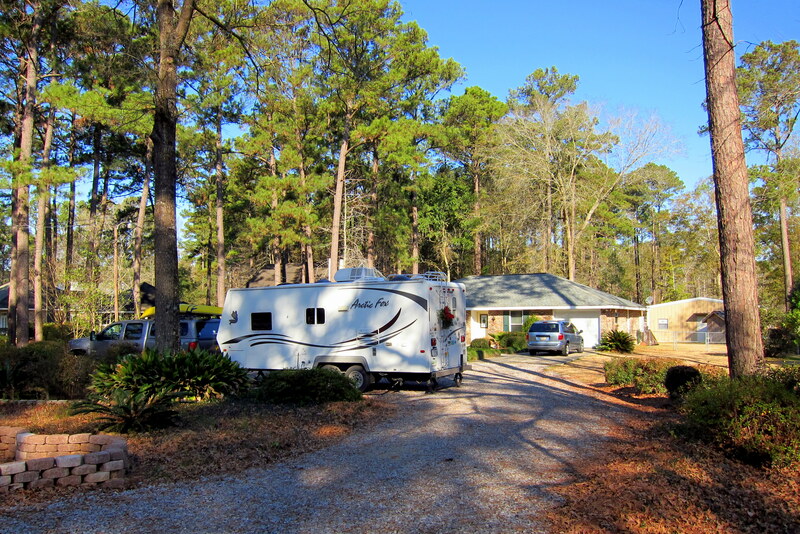 Saturday, January 15, 2011: Woke to sunny skies, light winds and temperatures in the 50’s. Great weather for us but others in the campground were complaining about the cold weather. After a stop at the commissary, exchange and gas station we pulled out around noon and onto US-90 heading west. In the last journal I mentioned we had a new traveling companion. He is a small stuffed animal that has been entrusted to us by Stephen, the son of my cousin’s Mark and Ruth from Pennsylvania. Stephen is in the third grade and is participating in a school geography assignment where a stuffed animal and notebook journal is sent to friends and relatives who are asked to write in the journal about their particular area. Since Stephen knew that we were preparing for an RV trip he asked if his traveling animal could accompany us. Of course, we were delighted to participate in his school project and as a bonus we thought he and Mr. Bill could keep each other company. 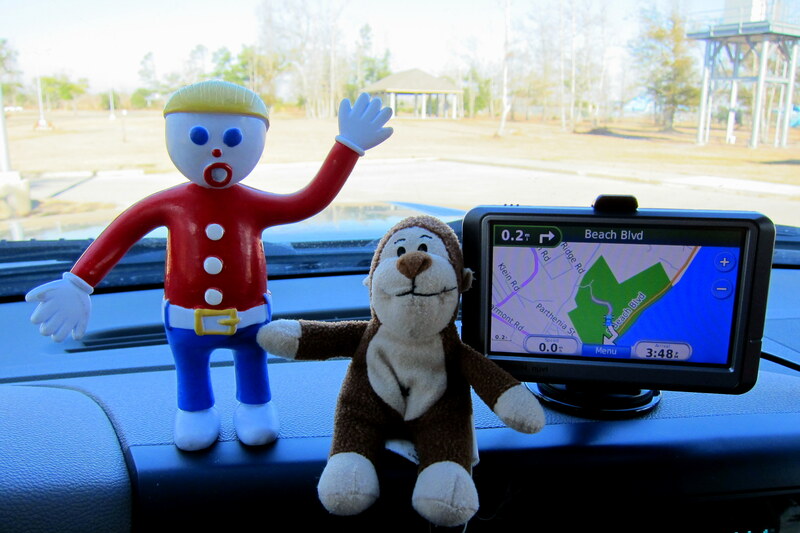 Here is a photo of Mr. Bill with Stephen’s traveling animal…..Marvelous Monkey. It has been two years since we traveled US-90 through Mississippi and a lot of rebuilding has occurred since Hurricane Katrina made her devastating landfall five years ago. There were still a great many coastal lots with just foundations remaining of what once was someone’s beachfront paradise. Most of the rebuilt homes were either being placed on raised foundations or, in many cases they were rebuilt on tall pilings. However that has been tried before to little effect. It’s hard for man to build a structure that can combat Mother Nature’s fury. Some folks have just given up and decided to sell. As we crossed Bay St. Louis we decided to detour south on Beach Boulevard toward Waveland, Mississippi. The roadway was rough and in many places it was completely washed out or covered with deep sand. The local folks that still live here and are continuing to rebuild were gracious in accommodating my slow progress and frequent stops to take pictures. You gotta love the spirit and determination of the people of the Gulf Coast. We didn’t see any remnants of this summer’s BP oil fiasco and the beaches looked as pristine and beautiful as always. As we neared the town of Waveland I stopped to take a picture of a small brick building sitting in the middle of a very large lot. 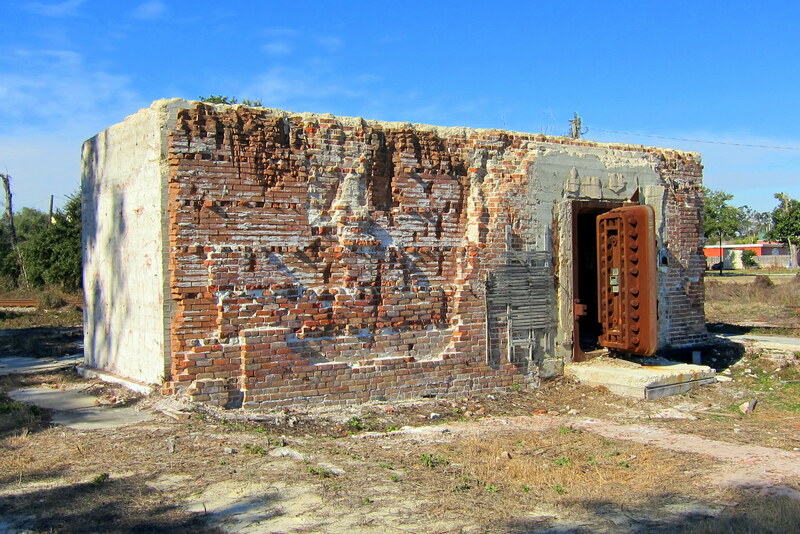 Curious, I went to investigate, and that’s when I realized that the brick building was actually a bank vault that should have been housed in a large bank building…..the bank building was totally gone! Blown away by Katrina!! We passed many areas where work was going on to reclaim and stabilize the tidal zone of the bay. It looks as if the entire stretch of Beach Boulevard will need to be rebuilt as well. A bit down the road we came to the local Catholic Church. The original church was memorialized by offerings on and around the destroyed churches foundation. You can see the new church in the background……what a testament of faith! 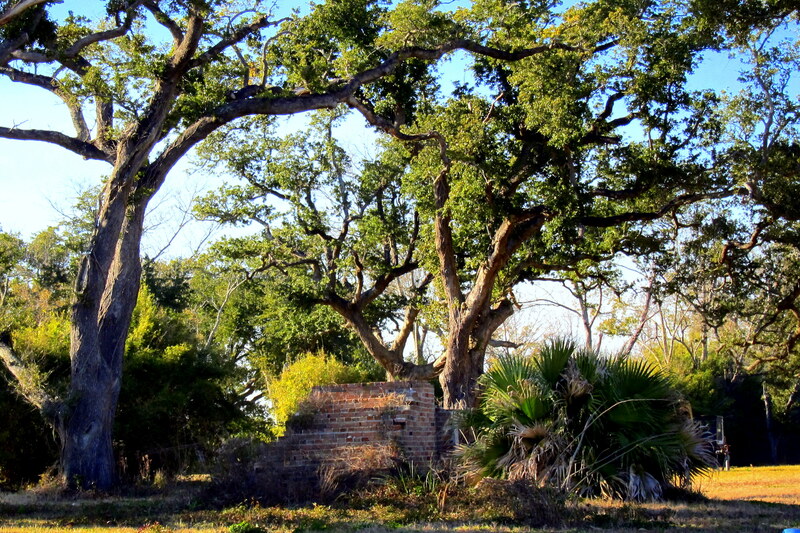 As a lucky happenstance we came upon Buccaneer State Park and decided to investigate. In talking to the ranger we learned that the park was just about back to full operation. 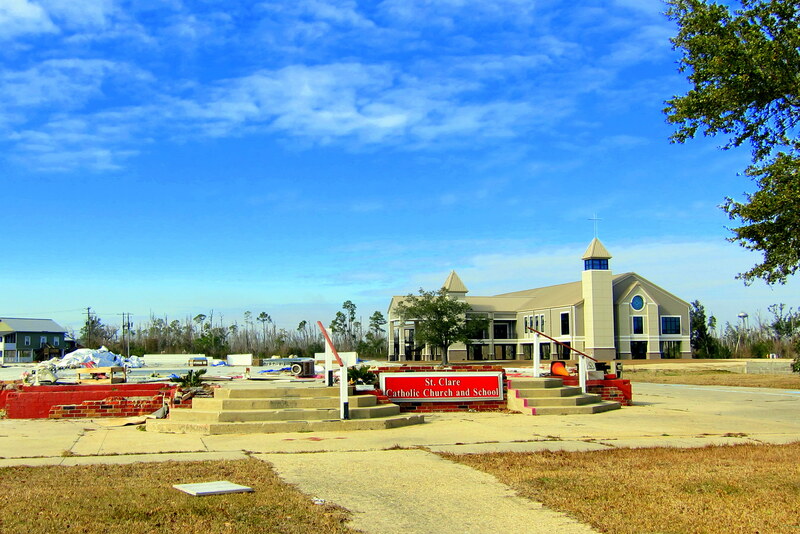 Following Katrina, what was left of the campground was used by FEMA and other storm recovery agencies as a local base of operations. Asking permission to drive around we noticed many new and very desirable camp sites with full hookups. Also, there were walking and biking paths around the surrounding coastal forest. We thought of staying right here for a few days but we are anxious to get into Louisiana and a reunion with old friends. However we will definitely stay here during a future trip. It is currently 1400 and the temperature is 58 degrees under bright blue skies. We decided to take advantage of the location and pull over for a late lunch which we enjoyed along with the ocean view out our window. Continuing west we crossed into Louisiana at 1530 and headed for Covington on the north shore of Lake Pontchartrain and a visit with our good friends Johnny and Eileen. Arriving a half hour later we were showered with southern hospitality and invited to set up for the night in their dooryard, or what I like to call, “The Johnny Reb and Southern Belle RV Park”. Next Issue…..fun with Johnny and Eileen…..stay tuned. 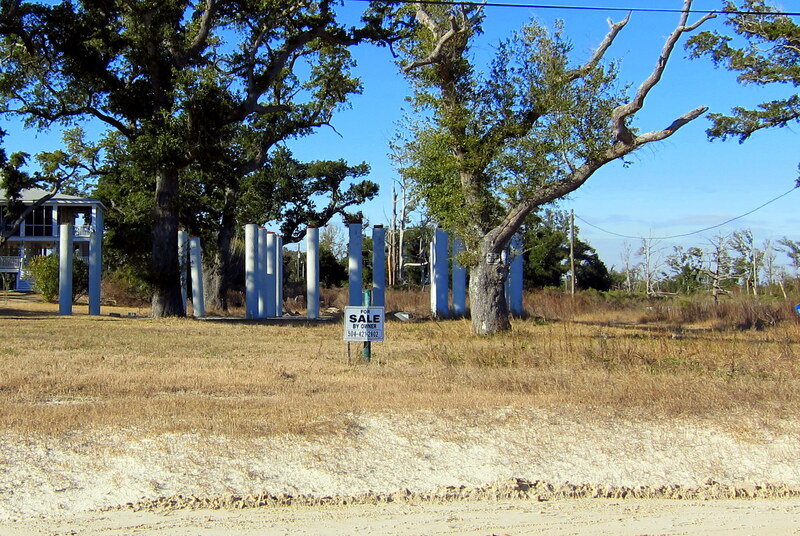 It was interesting to see the progress, or lack of, in the Gulf Coast area. It appears that only about 20% of the property owners have elected to rebuild. Many of the properties are for sale. Most of them are just bare, with a few signs of the hurricane left. The properties that have been rebuilt are very nice. Also, there is still quite a bit of road work to be done in the area. Much of the beach road was blocked off due to construction. The picture of the bank vaultis so cool! Now, as long as someone knows the combo…that would be the place to hold out until the storm blows over! Like the addition of the quote. It adds interest to the posting. I also enjoyed reading the background story to the additional of Marvelous Monkey. Your pictures add considerably to your narrative. I have to learn to add more pictures to my blog. Don’t be wasting time in all those southern places. San Diego is warm, 70 degrees + all this week and sunny. We are so excited that you are heading out on the road again and can’t wait to see you. Maybe you’ll be here in time for an early baseball game. We are absolutely addicted to the Padres these days. There are a number of people that came to Texas after the storm. They still live here, they want to go back but there is nothing to go back to. Brad Pitt has built a number of homes, simple but safe. I agree, when a storm comes through that strong, stilts or high foundations, there is very little that can withstand that force. I have always wanted to drive through Mississippi after we were hit by Camile back in 69. I am sure it looked much the same with Katrina. Thanks for the brief view and the memories bad and good from that time. I’m a little slow reading this but always find them interesting. Can’t wait for green grass– and a trip somewhere warm. Enjoy and keep the creative writing coming. People down here make fun of us when we talk about the “dooryard” and ask us what it is. Glad to see you using it in your journal. Kathy, don’t know as I mentioned it before but the first “Hobby Lobby” that I ever went to was while we were in Covington in Dec. If you get a chance and have never been to one…be sure to go . You’ll love it! But then, you’ve probably already been and know how great it is. Continue to have fun and share it with us.